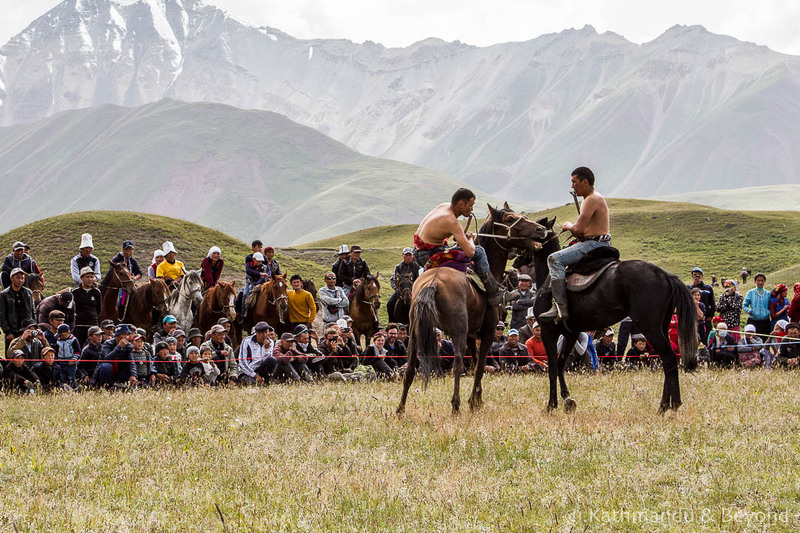 For me, one of the most intriguing things about the nomadic tribes in Kyrgyzstan is their traditional sports and games. 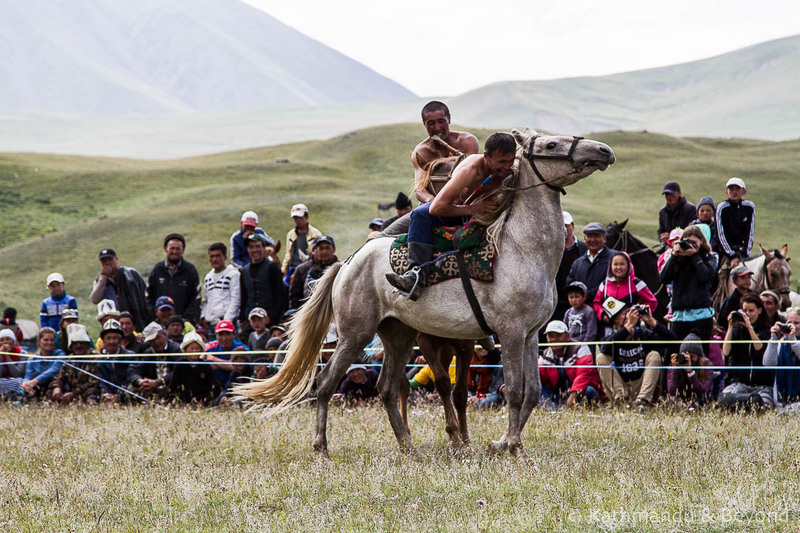 Central Asian games are unlike anything you’ll see at the Olympics, and focus on very macho skills including horsemanship and general strength and prowess. 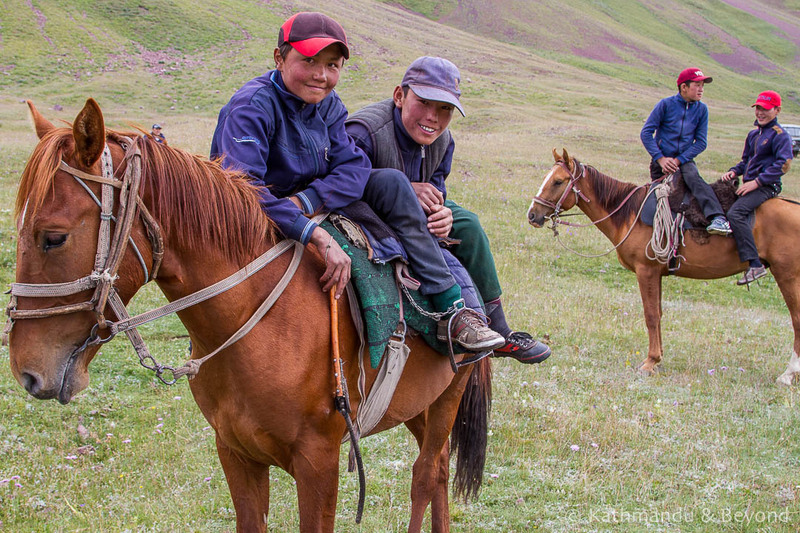 By happy chance, the start of our Pamir Highway trip coincided with the annual horse games taking place near Sary Mogol village in the Chong-Alay region of southern Kyrgyzstan. 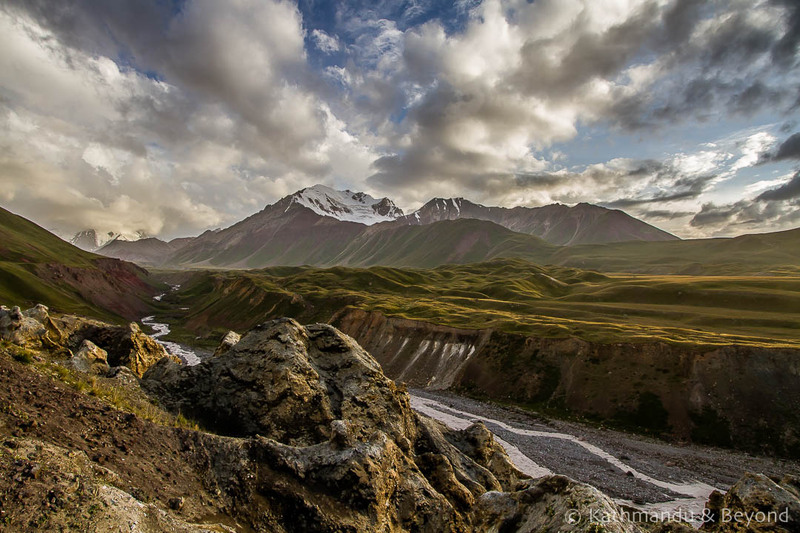 The shores of Lake Tulpar-Kul are usually deserted save for a summer yurt camp for tourists but once a year the grasslands attract nomads from across the region to compete in these customary games. 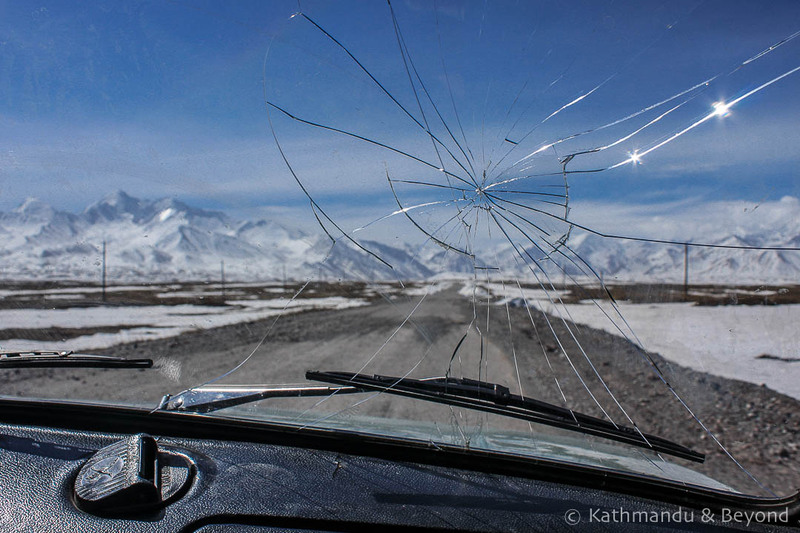 As we left the main road in Sary Mogol, driving across the wide, empty plains I was reminded of our time in Mongolia. 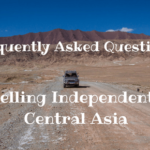 There was the same feeling of wondering if the driver knew where he was going, seeing as there were no roads to follow or GPS to guide him. 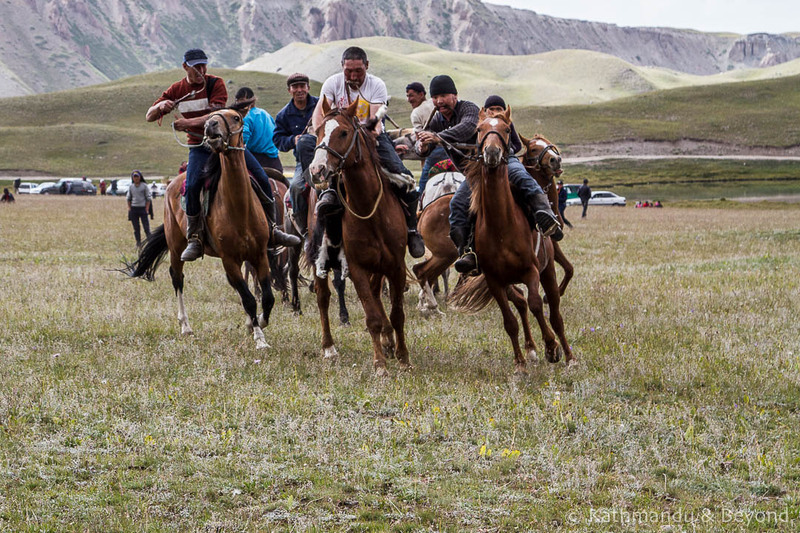 But of course, as on the Mongolian steppes, our driver knew exactly where he was heading and after an hour or so we arrived at the festival ground to find a mixture of Kyrgyz and foreigners milling about in anticipation. 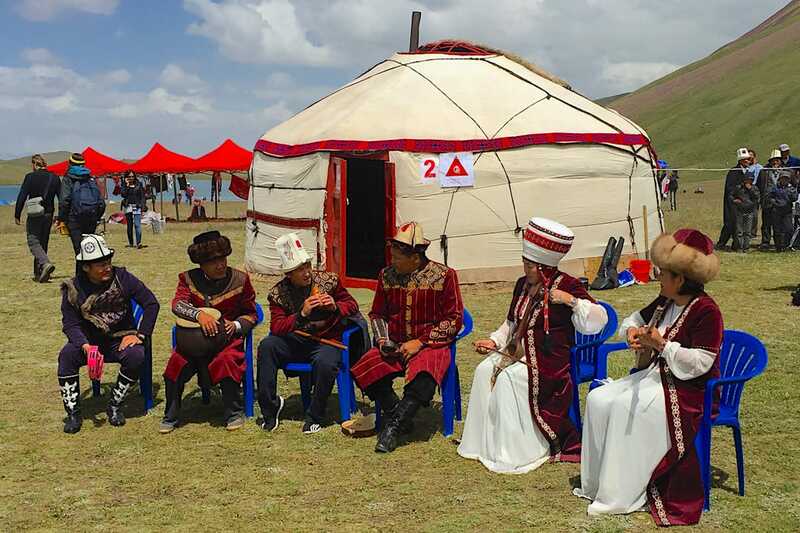 There was a mélange of vehicles including pickup trucks, horses, motorbikes and tourist 4x4s parked among a scattering of yurts set back from the lakeside. Although very interesting to witness, these fast-moving games were not easy to capture on camera, as you will see from our photographs! 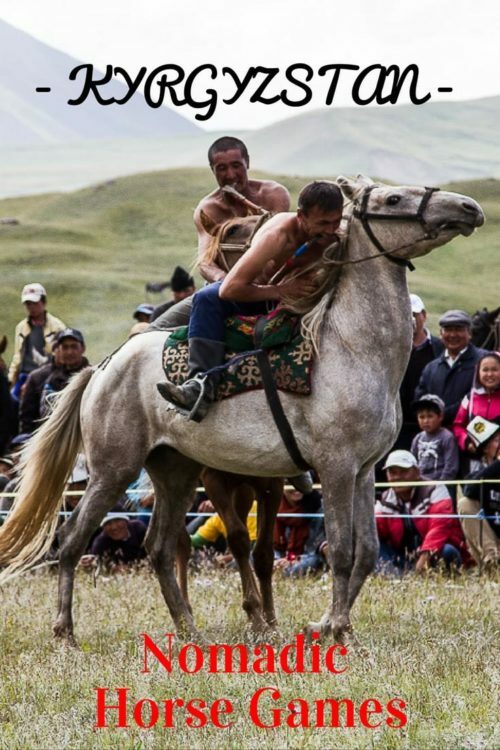 Hopefully though, they will give a good idea of this fascinating element of Kyrgyz culture. 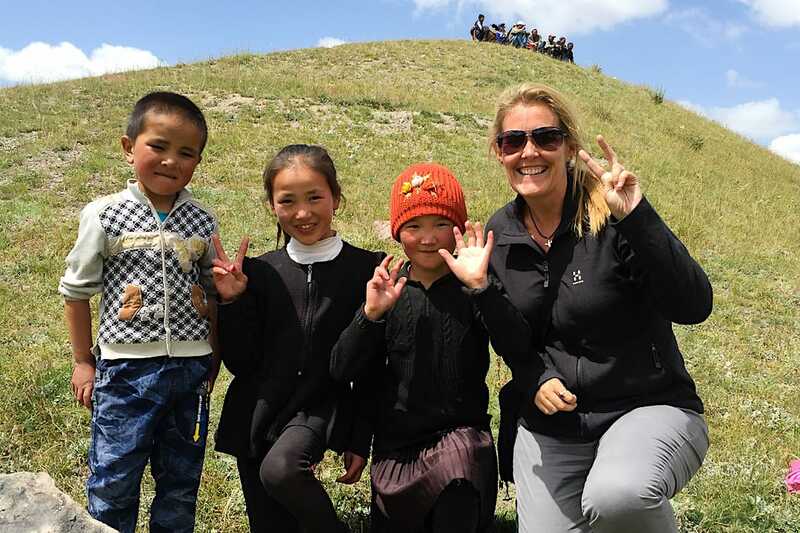 Goat Grabbing: Kok Boru or Ulak Tartysh or Tai Kazan! 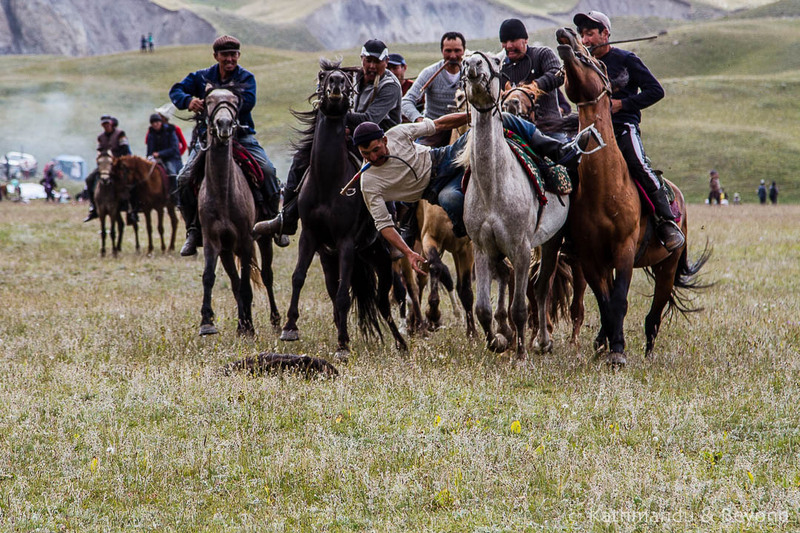 This is possibly the most famous of all traditional Central Asian sports and is more commonly known as buzkashi, the Afghan name for the game. We (and others) refer to it as dead goat polo. 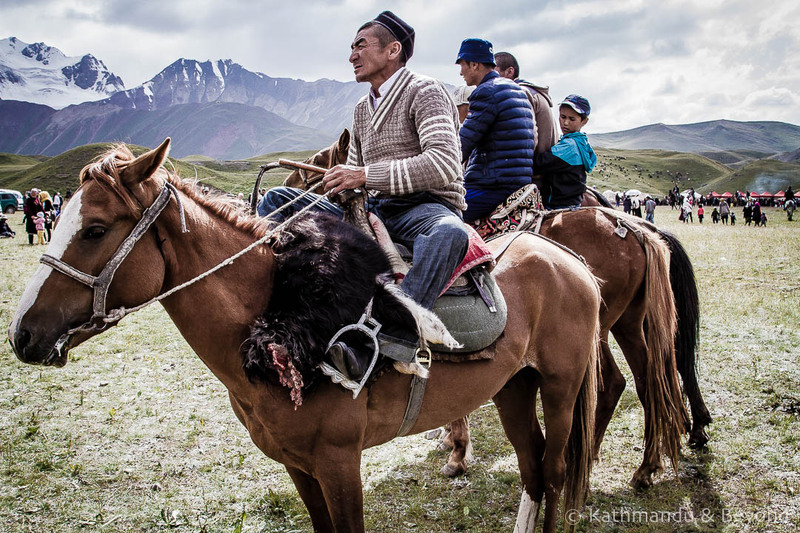 In Kyrgyz, the name translates as ‘blue wolf’ however buzkashi means ‘goat grabbing’, which offers a better explanation of what’s involved. 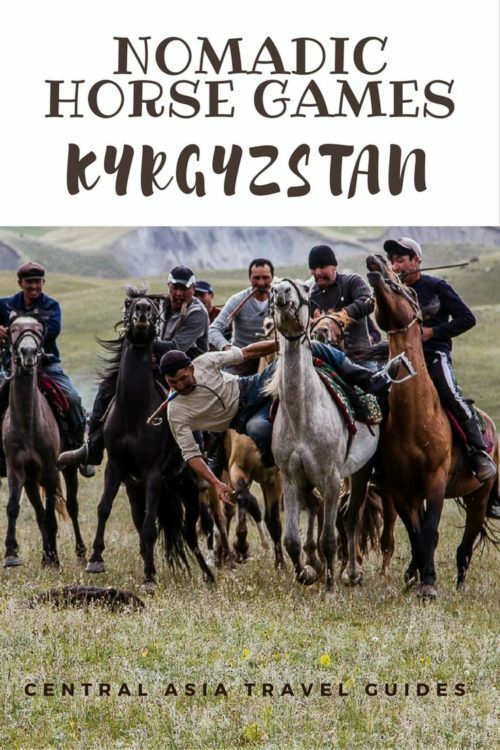 Two teams jostle and wrestle on horseback to win possession of the carcass of a dead, headless sheep or goat (it’s possibly not necessary to include the ‘dead’ part here!). Once procured, the aim is to ride like the wind and place the animal in the opponent’s goal. 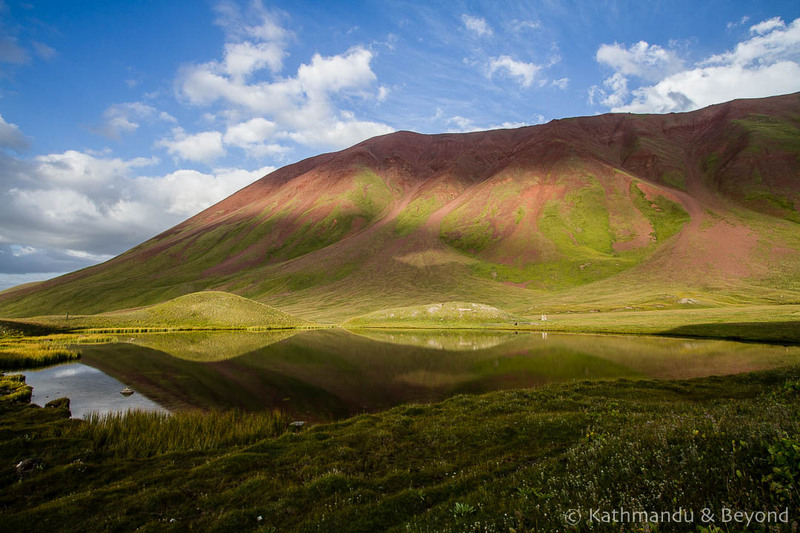 The goal is called the Tai Kazan and sometimes the name also goes by that name. Teams must have an equal number of players, the dimensions of the pitch are approximately 300 x 150 metres, and the duration of a game is 15 minutes. Other than that, there didn’t appear to be many rules that stipulate how to ‘pass’ the sheep – which can weigh up to 40 kilos – to teammates. It can be wrangled openly from the opposition, passed low on the ground or flung overhead. However, rules do forbid charging the horse, forcing it to rear up, or grabbing at the reins or bridle of the opponent’s horse. As spectators, it was important to keep our wits about us as, although there is a pitch, the galloping horses didn’t always respect the boundary and on more than one occasion it got a bit hairy as we were forced to jump up and run for fear of being trampled by a team of fast-approaching fast-running horses! This catchily-named horseback sport pretty much gives the nature of the game away, and accurately describes what it entails. Over a distance of around 100 metres, coins are placed on little mounds of white sand or sawdust at intermediate intervals along the course. 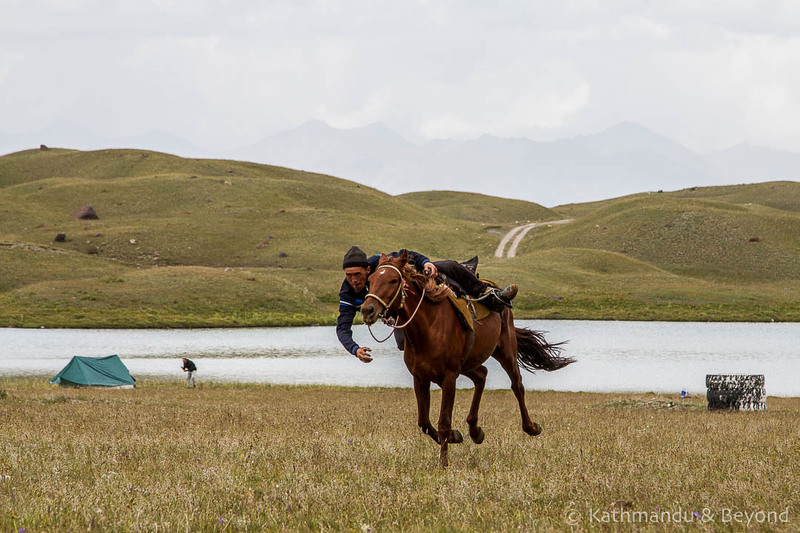 On the referee’s word, the rider sets off at a fast pace with the aim of reaching low from his galloping horse and grabbing the coin off the ground. If the judge considers the rider is going too slowly, or the horse comes to a halt, he will be disqualified. If he dips too low and falls off his horse, he must remount and continue to the finish line in order not to be disqualified from further rounds. Each participant is allowed three rounds and the winner is the rider who has managed to pick up the most coins. Whether or not the winner got to keep the coins was never explained. This is a game involving a man and a girl, each on their own horse. Riding as fast as they both can, the guy has to catch up with the girl who has a brief head start, grab her and kiss her! If he fails to catch her, she is allowed to beat him with her whip! This interesting game was once part of a traditional wedding ritual; the bridegroom riding in pursuit of, and ultimately hooking his bride, and thus proving his love and right to marry her. Being at a disadvantage, there was the possibility that the man wouldn’t catch his intended. However, this didn’t mean she would reject him, and the marriage would go ahead all the same. These days, when played as a competitive sport, the contestants ride in colourful traditional costume and it was a fun game to watch. 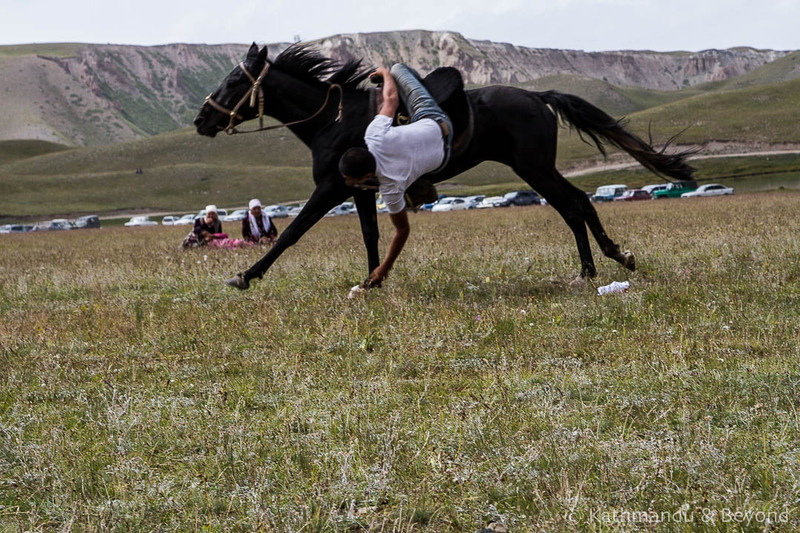 Another popular game within Central Asian nomadic culture, horseback wrestling was the most macho sport we saw. 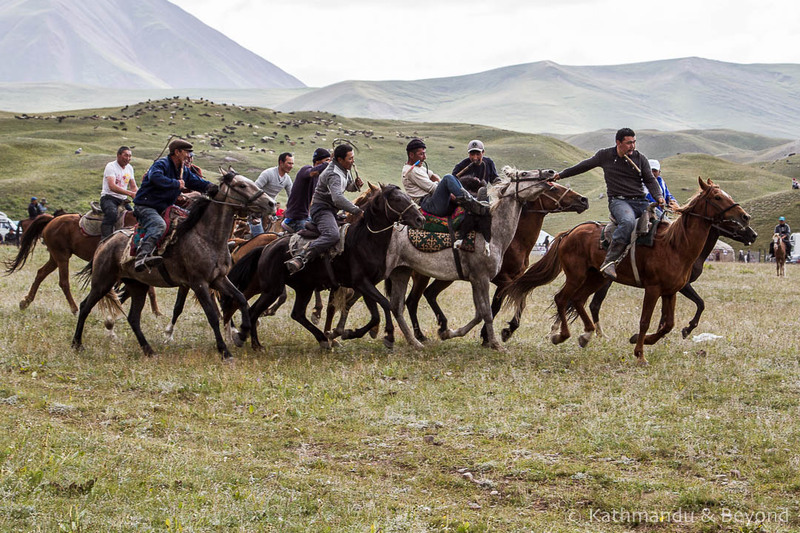 It was also one of the fastest-moving and exciting to watch as two riders attempted to pull each other from their horse. 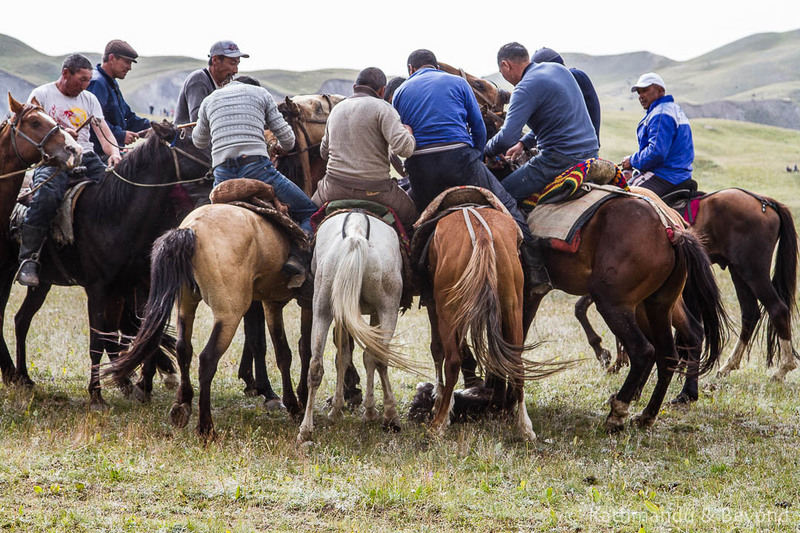 Each round lasts for 10 minutes and the rider who succeeds in pulling his rival off his horse, or throw him to the ground together with the horse, wins the competition. According to the rules, players are permitted to grab each other by the arms or torso, catch hold of each other’s sash and also to press his knees or feet against the trunk of the rival’s horse to lever the horseman off his steed. One can only pity the poor horses in this game! 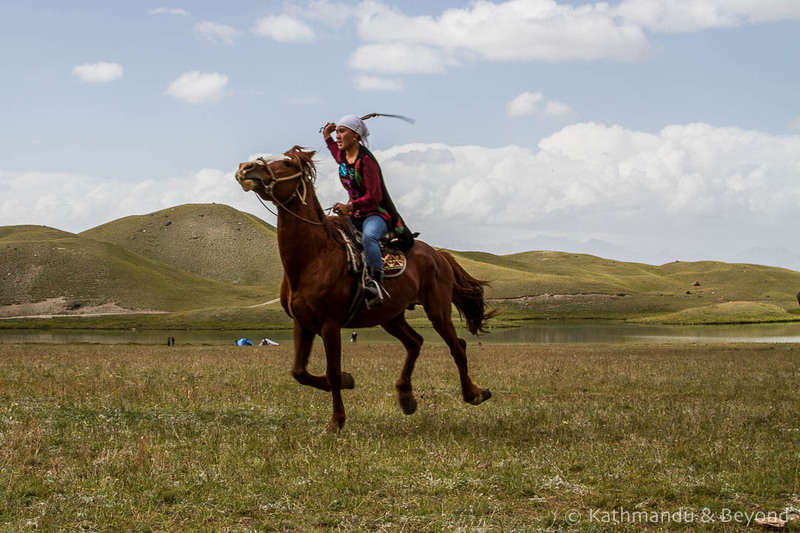 ARE YOU INTERESTED IN VISITING THE NEXT CBT SARY MOGOL NOMADIC GAMES AT LAKE TULPAR-KUL? The Sary Mogul branch of CBT sponsor the games, along with Visit Alay. 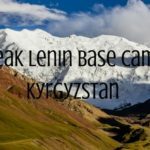 CBT operate a yurt camp at Lake Tulpar-Kul throughout the season. 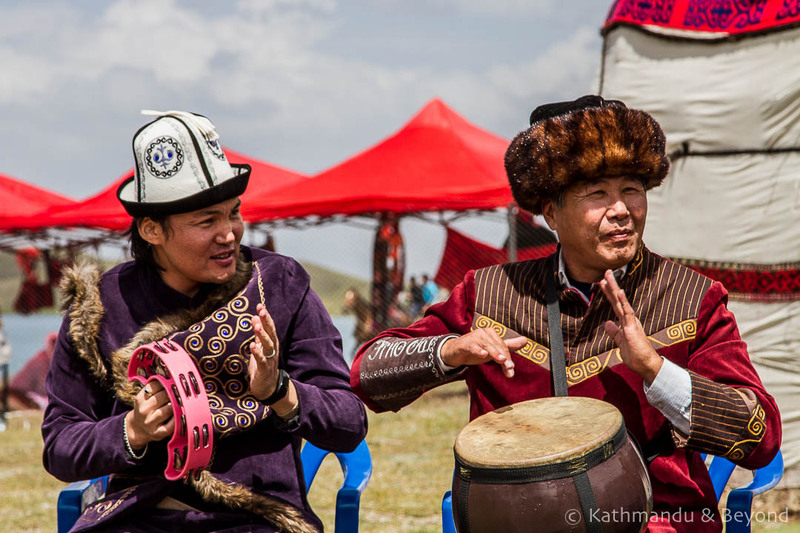 However, during the Horse Games they extend the services offered and host a special yurt camp, providing information about the games and traditional musical entertainment. 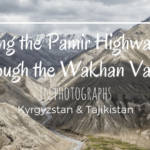 Like us, many tourists at the games had included a stop at Tulpar Kul as part of a longer trip on the Pamir Highway, and therefore were travelling with a vehicle and driver. However, for those attending the games as a side trip from Osh, CBT also offered shared transport. 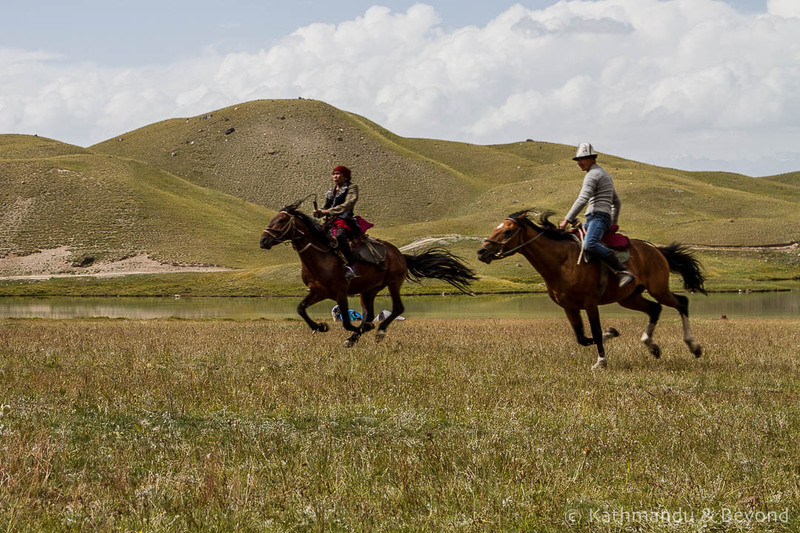 When do the Lake Tulpar Kul Horse Games take place? In 2016, the date of the games we attended fell on 30 July, but in 2018 the date for the ‘CBT Yak and National Horse Games Festival’ by CBT is scheduled to be Sunday 22 July. You can double check dates for this and other CBT future events and festivals here. Who hasn’t played “Chasing the Girl,” lost, and then suffered a whipping? 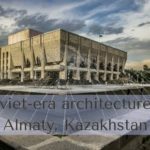 Very interesting post and great photos, despite your disclaimer. I particularly liked the one of the horseman swooping down to grab the headless goat.